Most people desire to travel and relax to unwind from the pressures of daily life. The unfortunate thing is that there is nowhere in this world where one can say that its 100% safe. We as travelers need to excise wisdom especially when we travel to foreign countries or even when we walk down the street in our own country. Traveling to destinations that one is not familiar with can be quite exciting. In our travel plans, we need to have accessories and equipment that will ensure that our personal effects are safe with us. In this blog post we are going to look at some of the best RFID blocking bags, purses,backpacks and wallets that will help protect you from credit card theft and let you enjoy your vacation or as commute in public spaces. RFID blocking products are designed to block scammers and thieves from stealing your credit card/debit card information through wireless technology when they are close you. RFID scanning technology makes it convenient for thieves to walk near you & steal your information. I’ve even read of cases where card information theft is executed with nothing more than a smartphone and a free app. 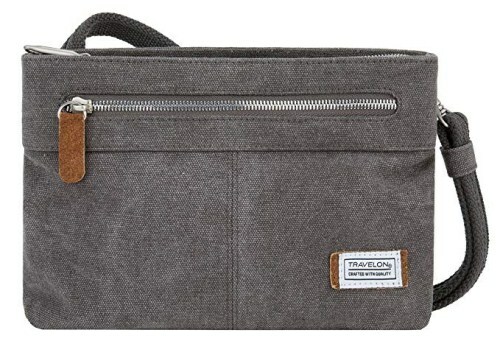 This is a very very popular travel bag that is also known as the anti-theft heritage canvas purse. The measurement of this bag is about 10 inches wide 8 inches high and about by 2 inches deep. It also has an adjustable strap that will go from 13 to 25 inches. Its sold in three different colors ie; Pewter, Indigo and wine. – Exterior Dimensions(inches):9.75 x 7.75 x 2. What are some of the positive things about this bag that makes it a popular choice with buyers? First, this bag allows you to lock the outside zipper. Tis is a key feature to have especially if you find yourself in crowded spaces such a bus. It will stop or frustrate a pickpocket who tries to open it and steal from you. The other thing is that the material that is used to make this bag looks and feels great all the way down to strap and zipper tags. There is also an inbuilt LED light within the pockets of the bag (which is detachable) which comes in handy when you want to search for something in the dark and need the flashlight to help you see well. The inside linings of the bag contain a mesh of stainless steel wires that will frustrate and stop a thief who would try to slash the bag to spill its contents. The straps also contain the same wires that will prevent thieves from slashing the bag straps. Another excellent security feature of the purse is that at the end of the strap there is a little swivel locking attachment that allow you to detach the strap from the bag and then weave the strap around a chair in a restaurant, a shopping cart or the seat arm in a bus then attach the end back to the bag. This stops a potential thief from grabbing your bag and running away with it. Its adjustable straps allow you to adjust the strap length so that you can wear it crossbody or over the shoulder. at 13 to 25 okay and it’s ultra lightweight it weighs only 15 ounces. This travel purse is a very good choice for travelers. 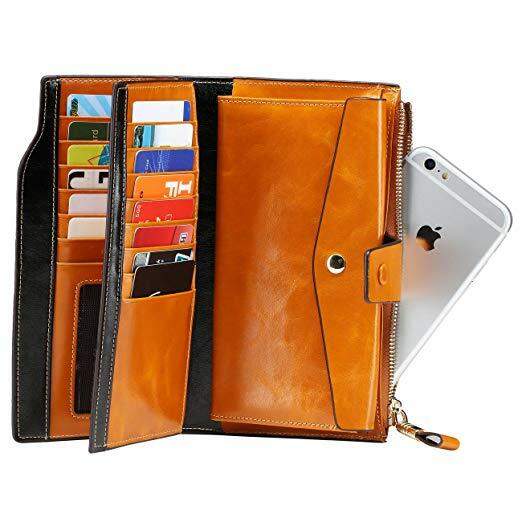 Its pockets are optimal in size its security features allow you to protect your credit cards from RFID scammers, stop potential thieves from spilling the contents of your bag through slashing or grabbing. Is the RFID blocking across the whole bag or? No, its just on one of the interior zippered pocket. Below is a short 7 minute video giving more details about this bag. 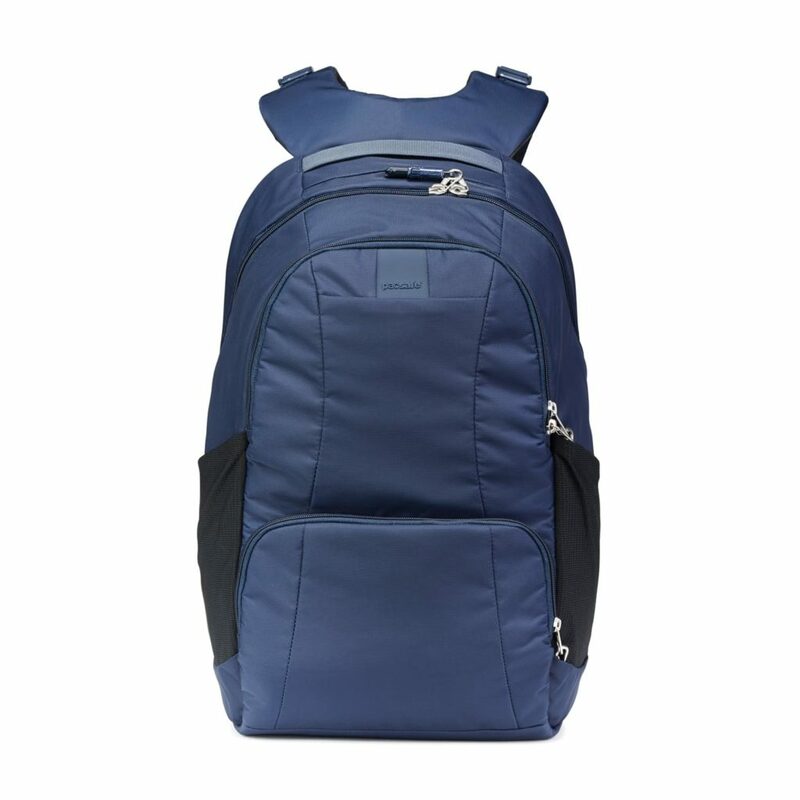 The Pacsafe Metrosafe LS450 Anti-Theft 25L Backpack is a popular backpack that is made out of a really sturdy nylon material designed to keep your personal belongings well protected. There is also great storage at the front of the bag with pockets found at the bottom and the other on top. The top pocket has some good padding in there where you can keep your delicate items such as mobile phones and sunglasses. There is a lockable closure on the very top of the backpack that you have to unclip in order to open it up reveling lots of space to carry your stuff. The Lockabout Security Clip and Smart Zipper Security provide multiple layers of protection and lockdown points for zippers to help protect against pickpockets. The bag has a lightweight, hidden exomesh slash guard stainless steel wire mesh embedded within the fabric to stop slash-and-run thieves. The backpack can hold a volume of 25-liters & it weighs just about 1.75 pounds. Below is a short video explaining more about this backpack..
Made of 100% Napa genuine leather. Its softer, more breathable & glossier. Napa leather is made of small goats or sheep skin which is soft and long lasting. Napa leather is also used in premium class leather goods such as premium furniture, accessories and car interiors. When you compare it with other big and bulky wallet, this one does not bulge your front pocket with the added advantage of feeling comfortable in your pocket even if you sit down for a long time or drive with it..
Once you get your hands on one of these wallets, you will notice from its features that the drivers license is placed behind a piece of clear plastic. It might be hard to move but you can clearly see it. The credit cards can be placed in the slots behind the drivers licence which is easy to remove and insert. In order to insert cash, you will have to fold the bills in order for them to fit in. If you use cash everyday, probably you would need a thicker wallet but if your primary method to purchase goods is through credit cards, then this is the wallet for you. This is a very popular women’s wallet with over 2000 reviews on the internet. Colors: 33 different types of colors for these wallets. Has RFID blocking technology to keep your credit card safe from card scammers. Wallet has been designed using a unique military grade shielding technology & proprietary blocking material compared to other wallets. 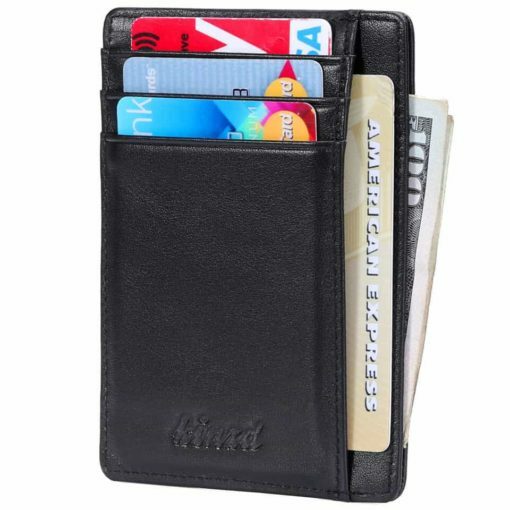 Has 21 card slots that includes one ID window, three full-length bill compartments, one snap cash pocket & 1 zipper phone case. Comes with a 1 year money back guarantee.